There are few occasions when you actually realise the forces of nature and how little you can do when you experience them. Just accept it. 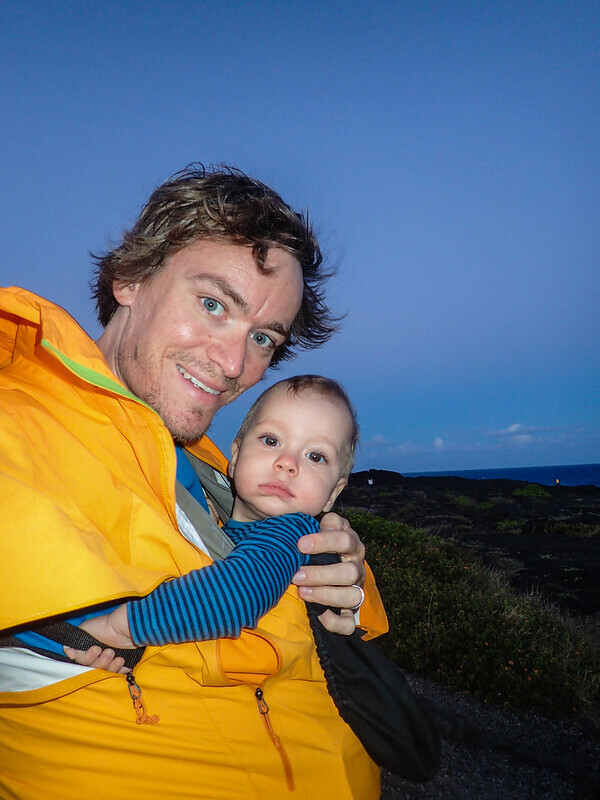 Twice on our trip I felt full of respect, a little fear and quite a bit of curiousity. Once in Cairns, when a type 4 cyclone was expected to hit the city, but turned out to hit the shore further north. It was interesting how it was the topic in the city over days. How camera teams reported from the shore. How the people prepared and the rescue teams entered the city preventively. 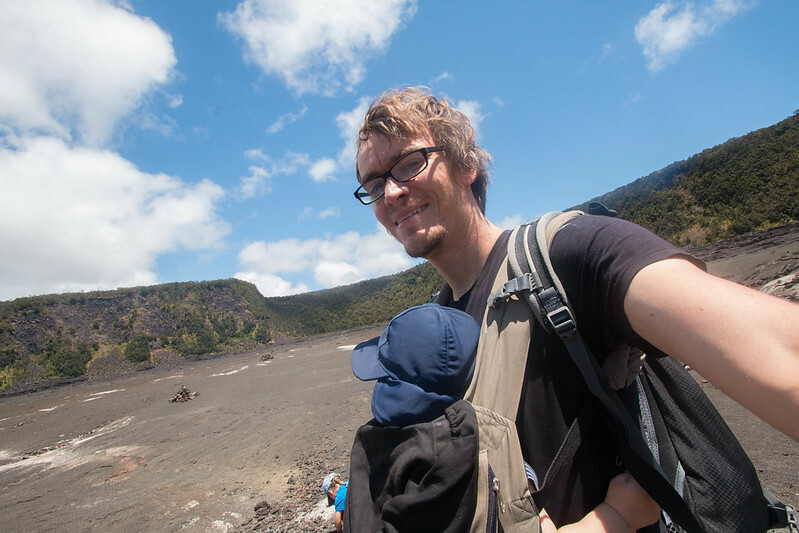 And a second time in the Volcanoes National Park on Hawai’i. Living close to the park was a luxury as we could go more than once. 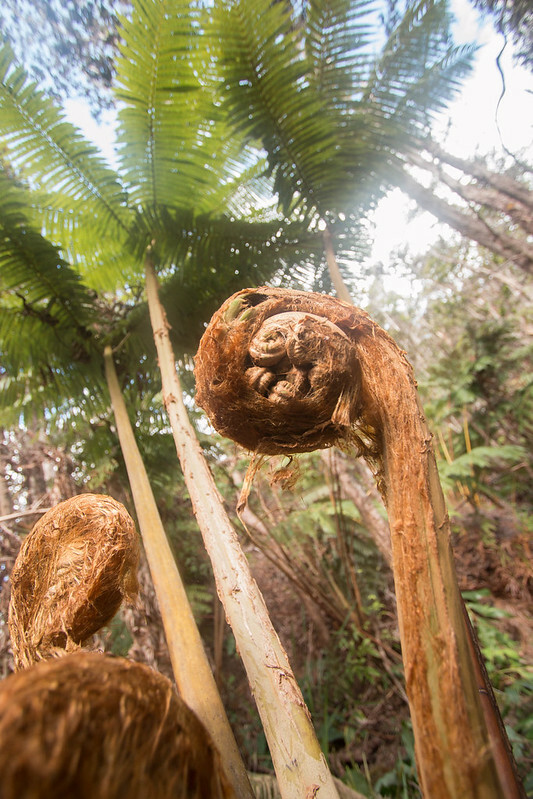 Each time we went there we were amazed by what we saw. 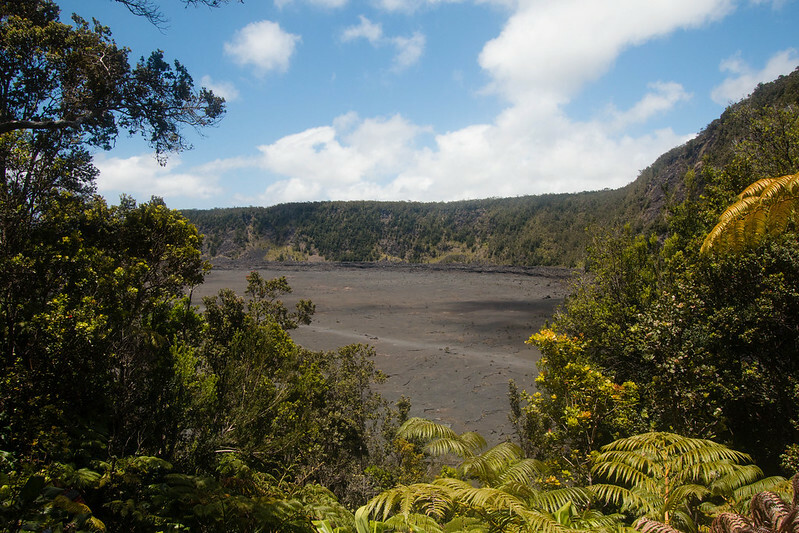 A real, active volcano is Kilauea within the National Park. 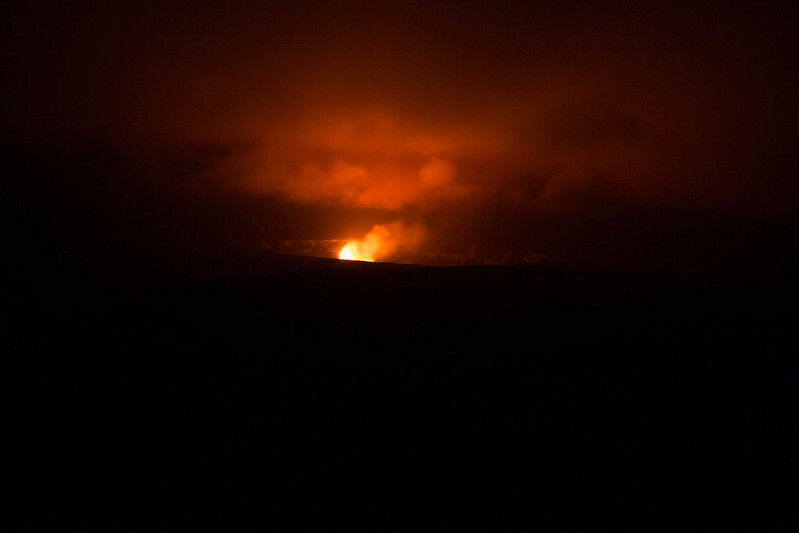 Currently there are two ongoing eruptions. 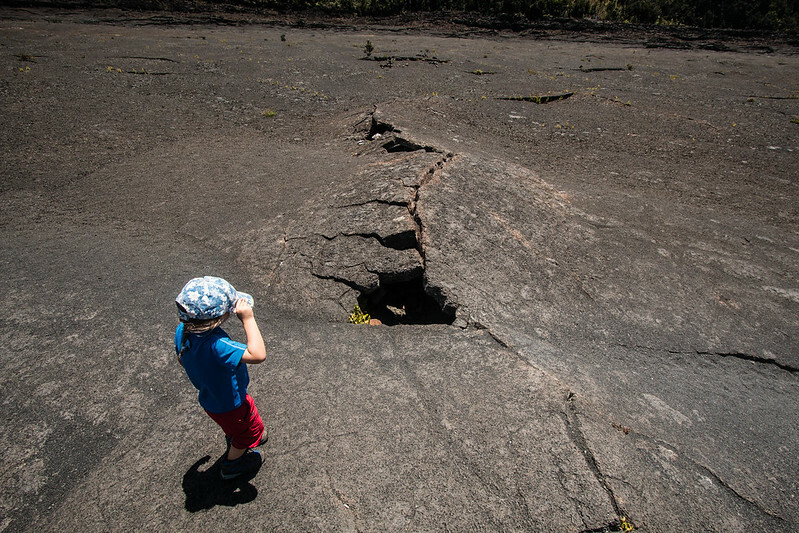 Pu’u ‘Ō’ō in the East Rift zone, with its last eruption in 2014, endangering Pahoa and Highway 130 that connects the southeast part of the island with Hilo, its biggest city. 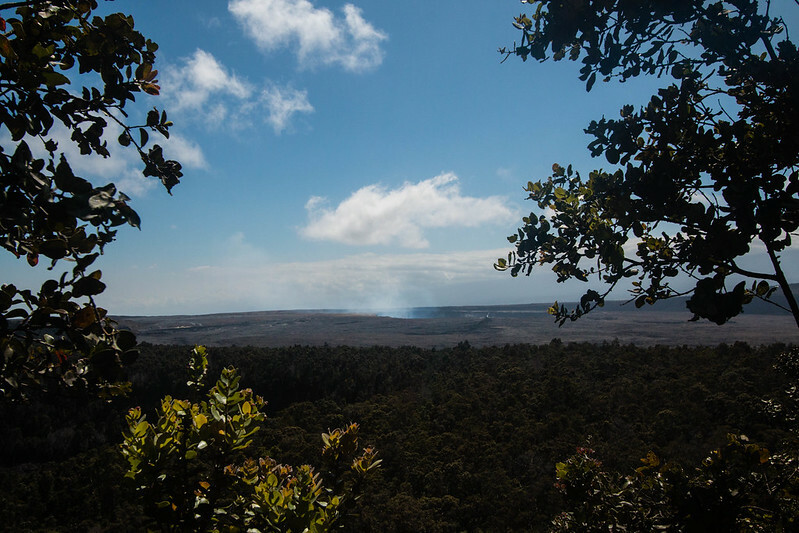 The lava flows are mostly underground and the area is closed for the public. 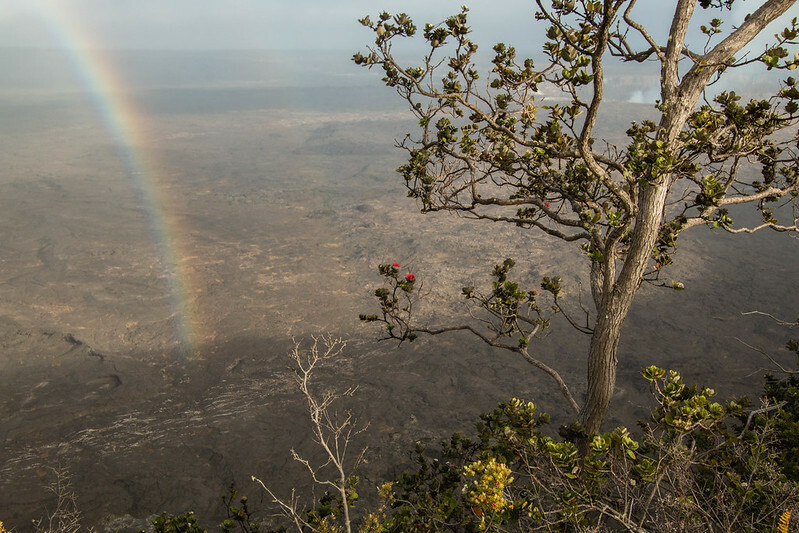 The other one is Halema’uma’u, home of volcano goddess Pele in Hawaiian mythology. 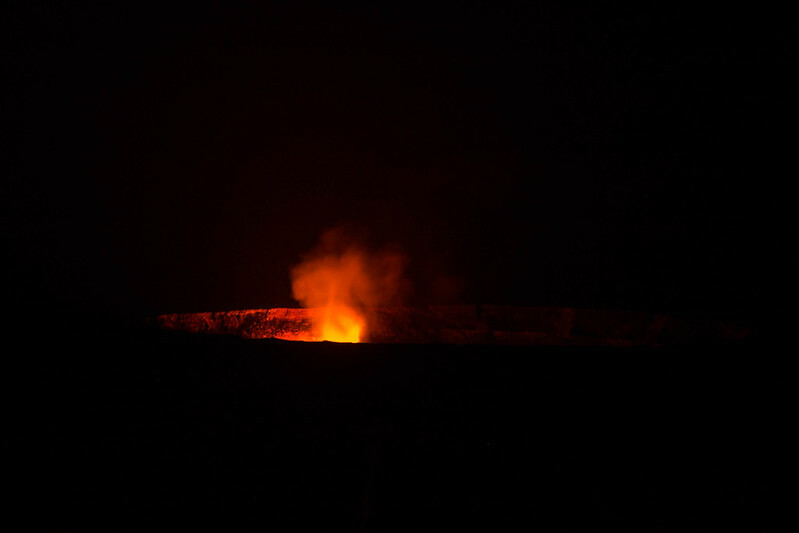 It’s active and the latest eruptions started in 2008. 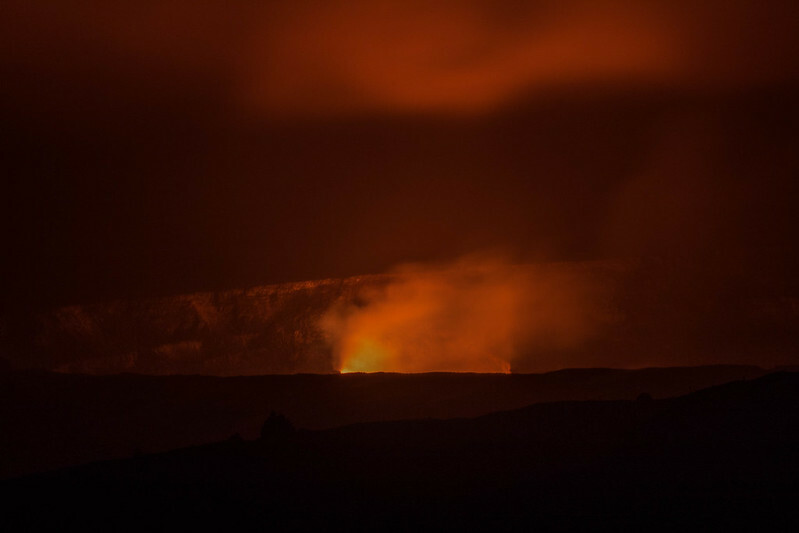 There is a red glowing lava lake in the crater and a continuous plume is visible. 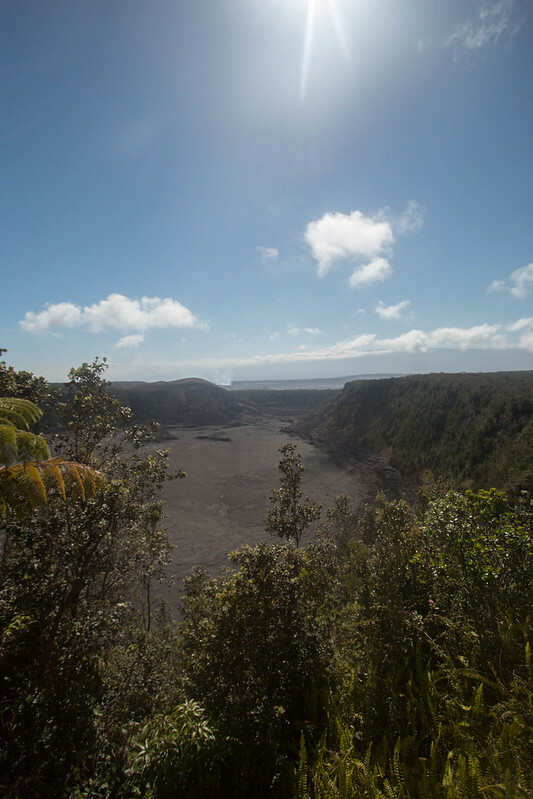 The crater is not accessible anymore but there are great viewpoints in the national park. 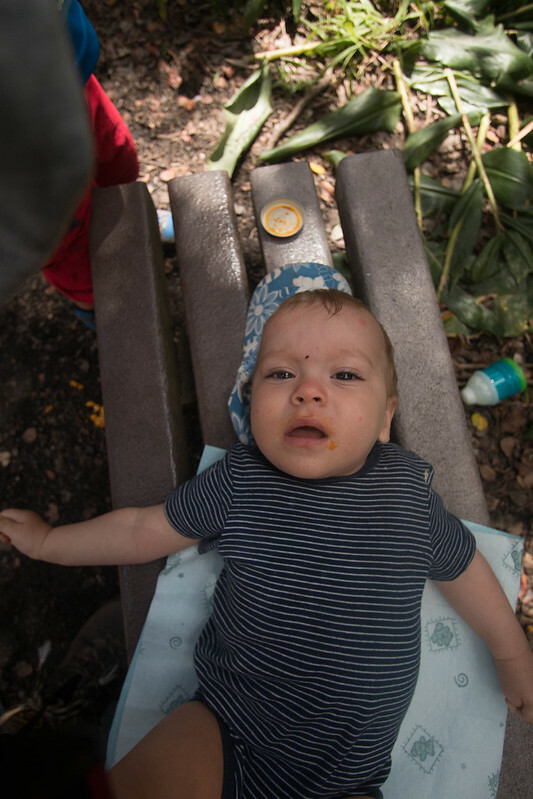 One at the Jaggar Museum and one further down the road at a picnic area. 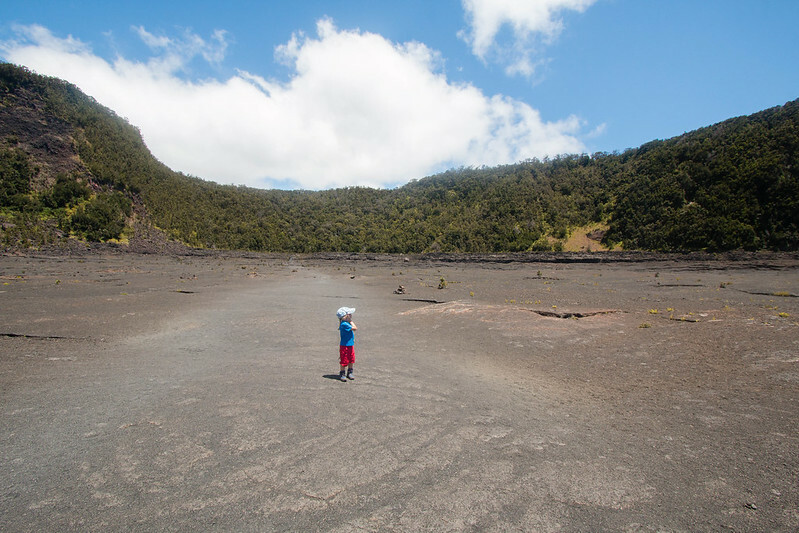 The latter is nicer, because there are less people watching the crater. Especially at night, when it’s absolutely pitch dark there and the couple of meters to the view point cannot be made without a torch in your hand. We went there a couple of times and enjoyed the views during the day and at night. 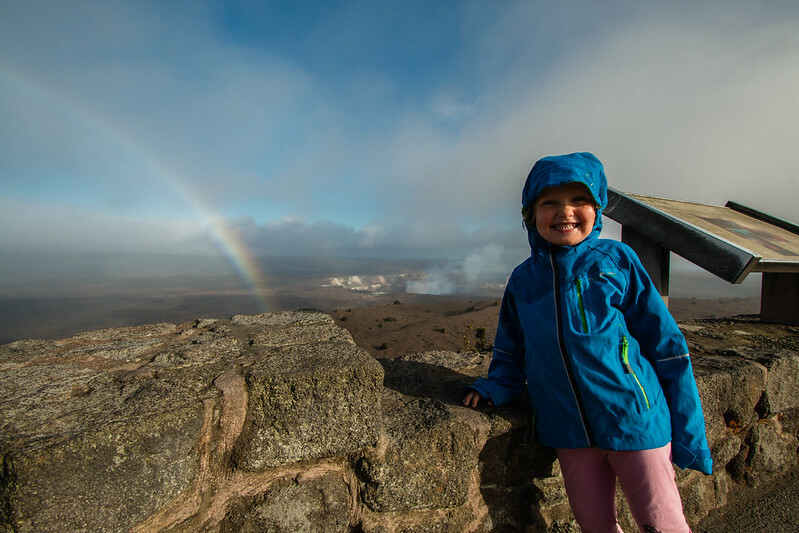 One day we were lucky enough to see a rainbow close to the crater and at night it’s just amazing to see the lava glowing, turning the clouds red. Driving through the park, or the highway along the park, you can see the glow for several miles if it’s not raining. And a day when it’s not raining at all in this area seems to be hard to find. 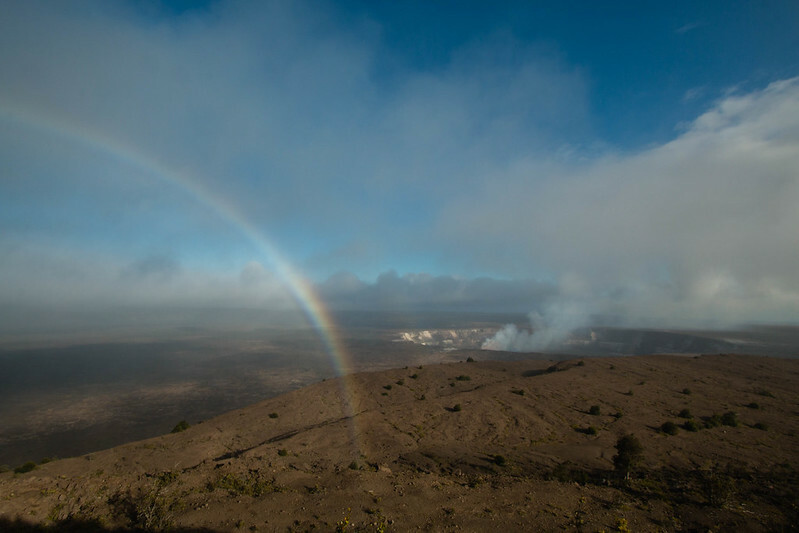 Clouds are collecting around the summit of Kilauea, so it’s very likely that a short rain shower will hit you. Even during a sunny day. 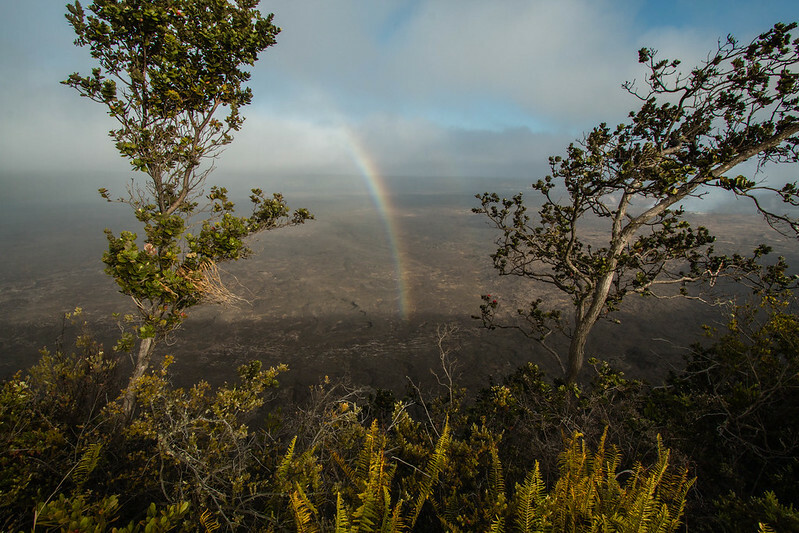 This road leads you from the summit area down to the sea and the Holei Sea Arch, a lava sight at the rocky shore right at the wild ocean. 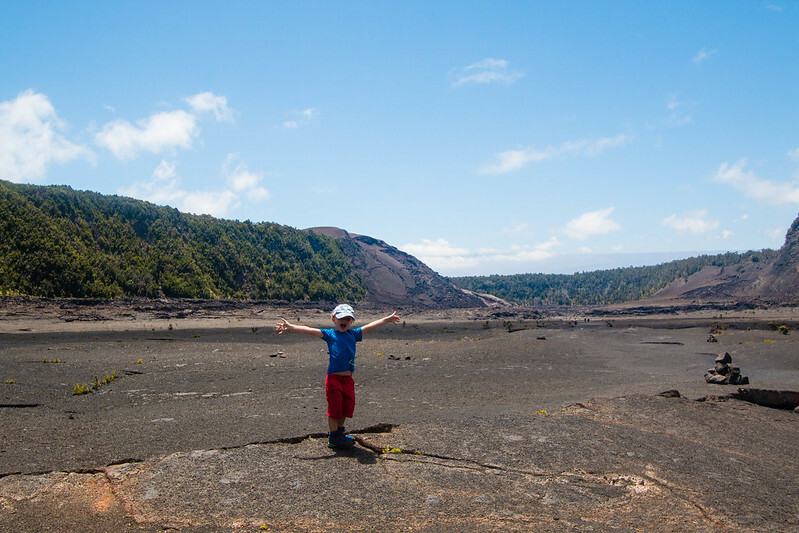 Along the road you go back in history, with tremendous lava fields resulting from earlier eruptions. 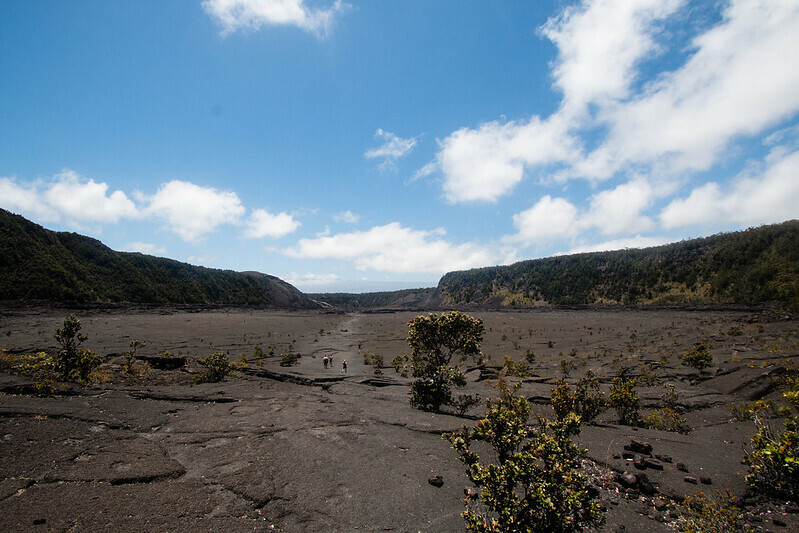 Many craters and a couple of hiking paths can be accessed from the road. 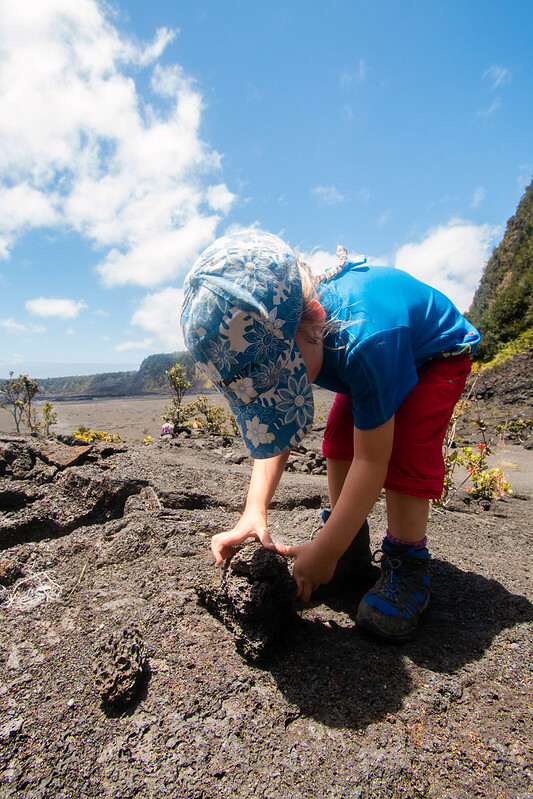 Unfortunately some are inaccessible with children because of the fumes leaving the places of eruption. 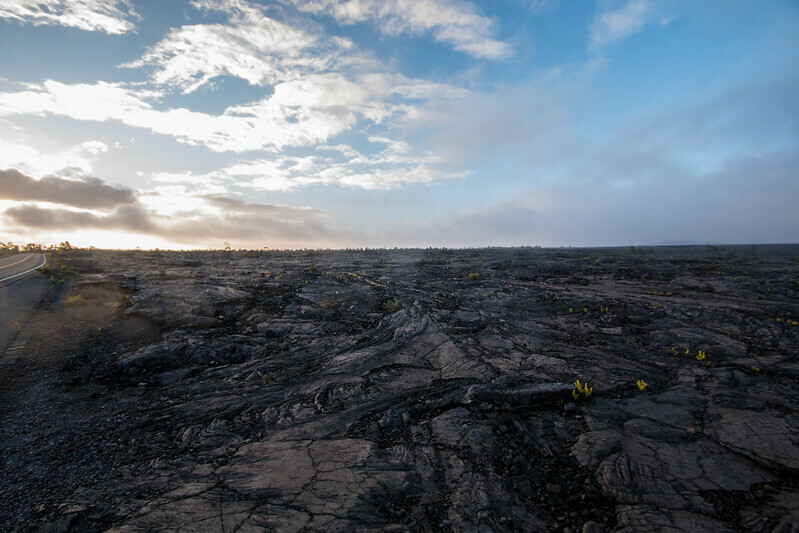 But what you sea are black lava fields to the sea which create a feeling of how it must have been and what an impact the unstoppable lava had on the nature and villages surrounding the volcano. 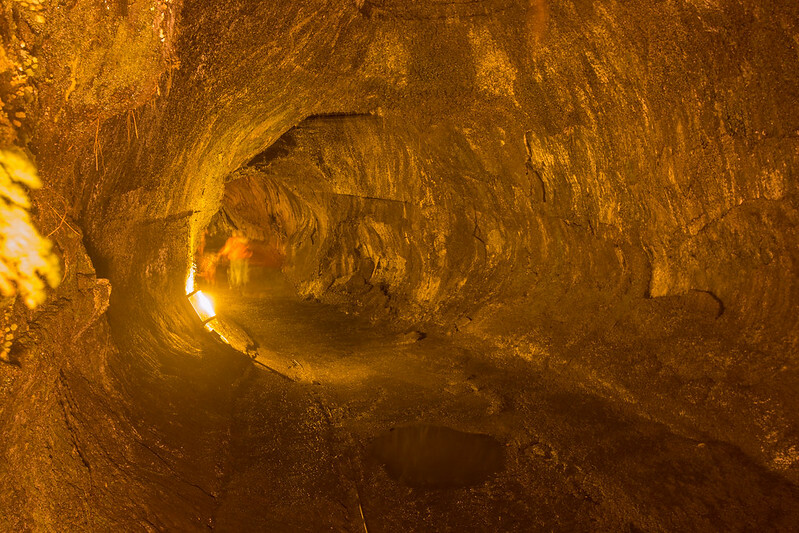 Another nice sight right at the beginning is the lava tube from an earlier eruption. You can follow a tunnel through the solid rock the lava has built a long time ago. In 1959 there was a huge eruption. The lava cooled down and solidified at some point. 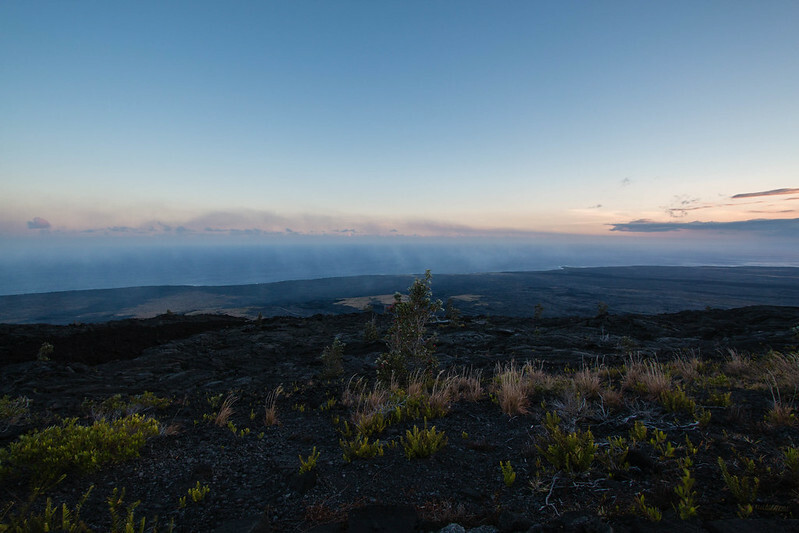 However, steam vents are still visible at some places. And now the place is ready for hiking. 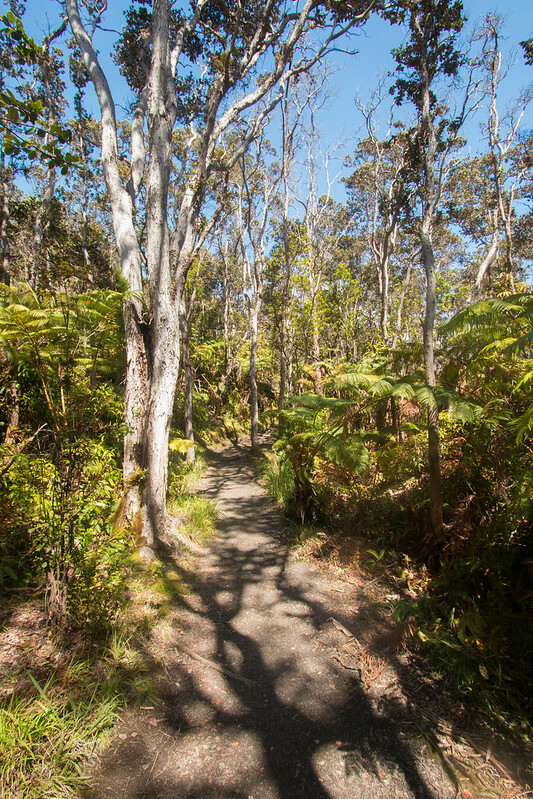 The path leads you through rainforest and over the entire bottom of the crater. 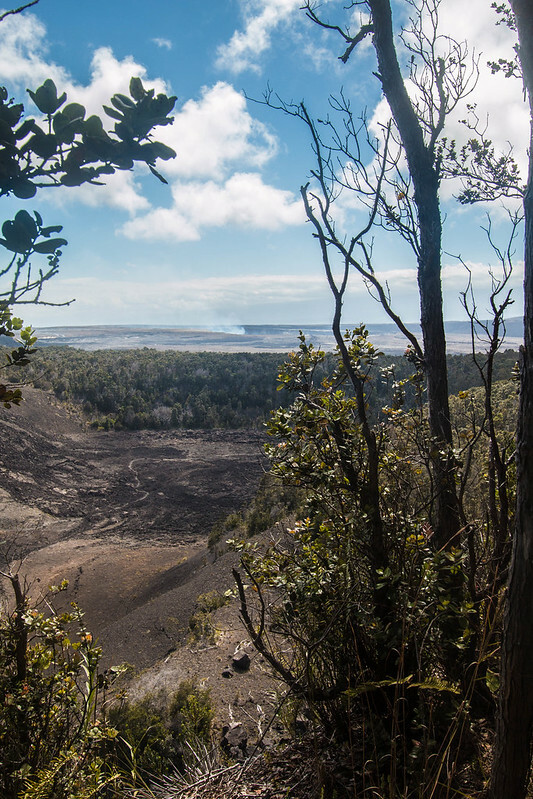 You get really close to the steam vents and the trail gives you wonderful views of the old crater and Halema’uma’u. 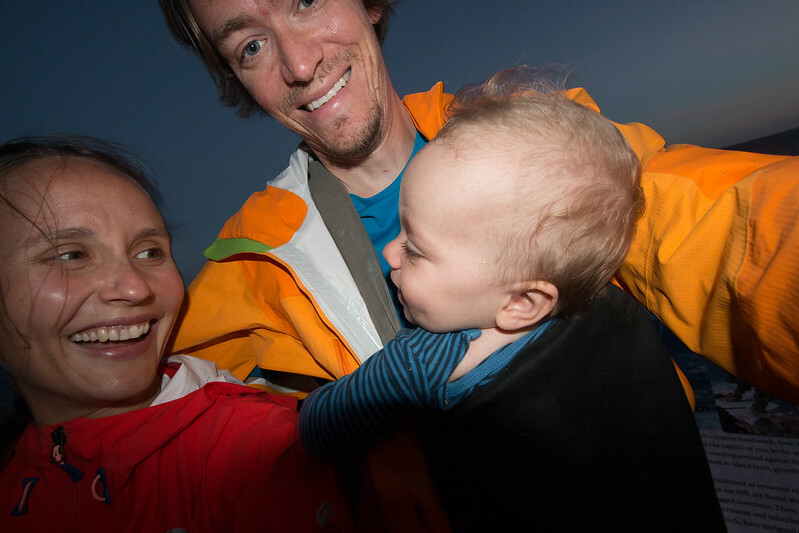 I hiked there with Linnéa and Niklas on my chest, as Annika had to work that day. 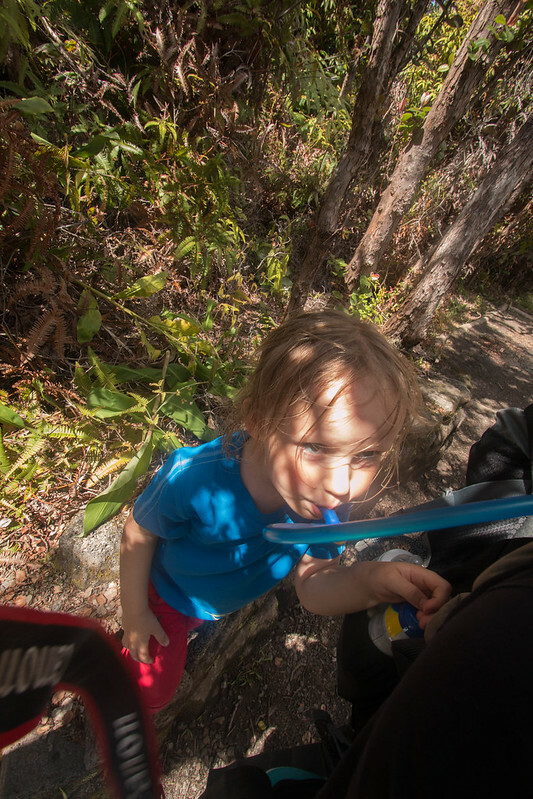 I was amazed how well Linnéa took the 4.5 mile trail. She (almost) didn’t complain, built stone men and asked me to translate everything on the way, so that we learned about plants I didn’t know existed. 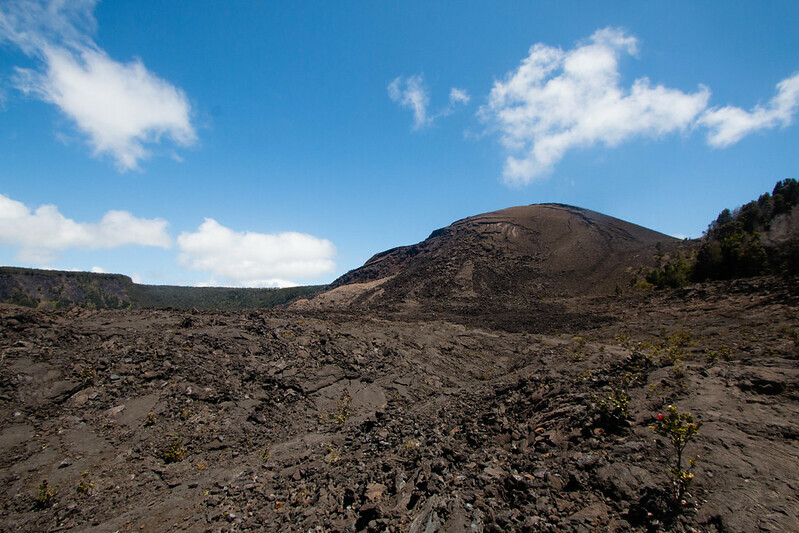 The trail is a bit tough when you walk down into the crater, and when you have to climb up to get out. But absolutely worth it! 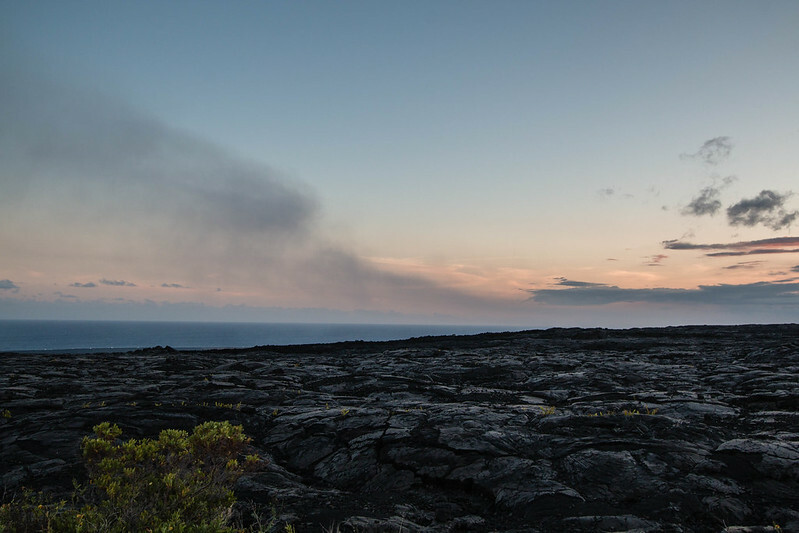 Though advertised everywhere, there is no lava stream floating into the ocean right now. 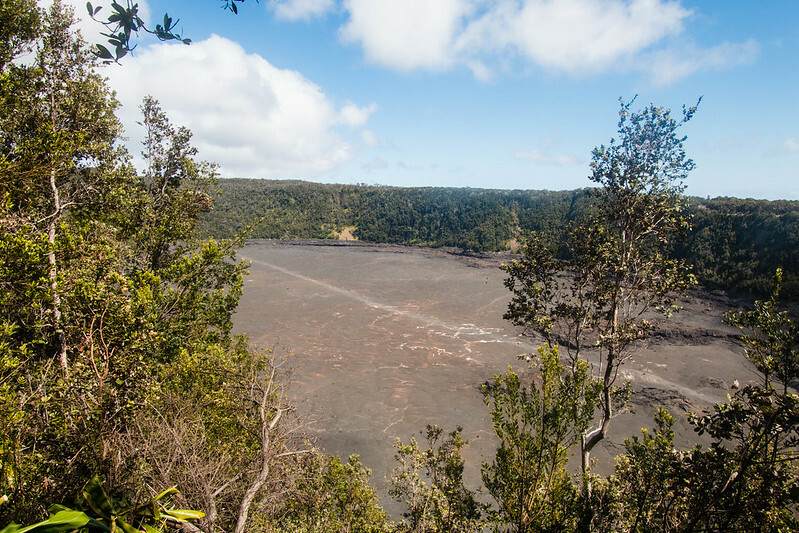 The lava stream in the East Rift Zone is mostly underground. We didn’t go on a hiking or helicopter trip. So I don’t know if it is worth it. 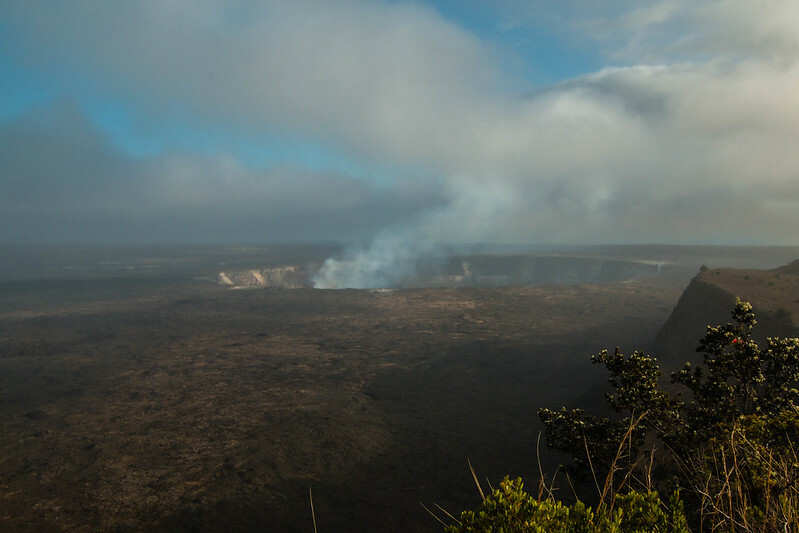 But a good way to check the lava situation is the web site of the park itself (http://www.nps.gov/havo/planyourvisit/lava2.htm). All in all the park is amazing and worth every minute you spend there. Beware of the weather, which changes within minutes from sunshine to heavy rain. Good to have rain jackets at hand. 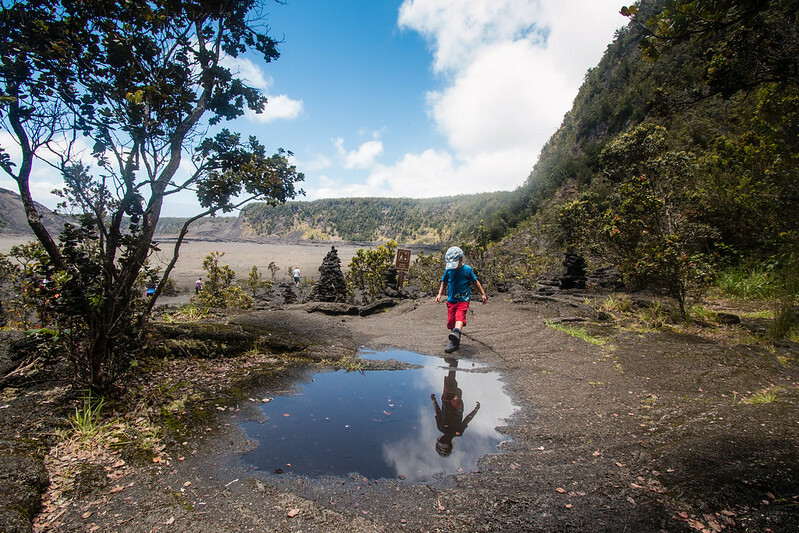 Once the rain stops you’ll be stunned by the beauty of the volcanoes and their ability to force changes to the island, nature and people. 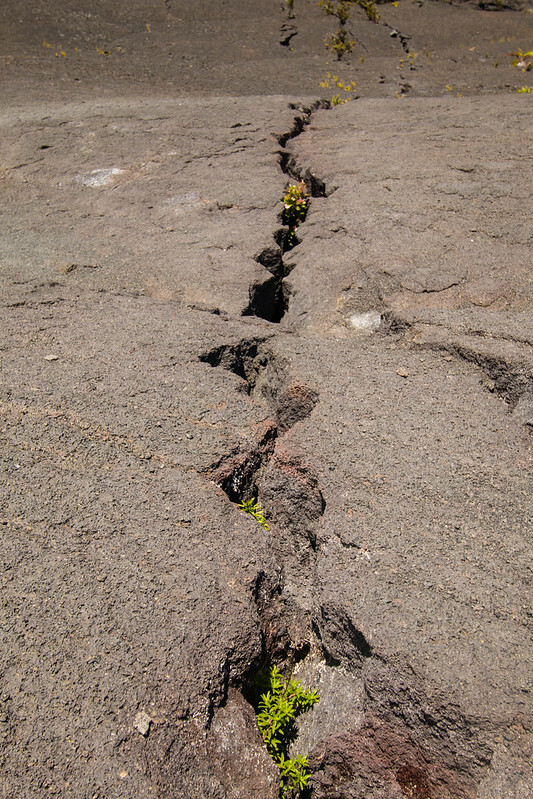 Cracks in the ground – sometimes steam coming out of them. A hot day and a long hike! Only now do I realize what an amazing trip you took and enjoyed reading the way you describe all the natural wonders of the world. I’m still at awe about the way you handled all of this with two such young children. 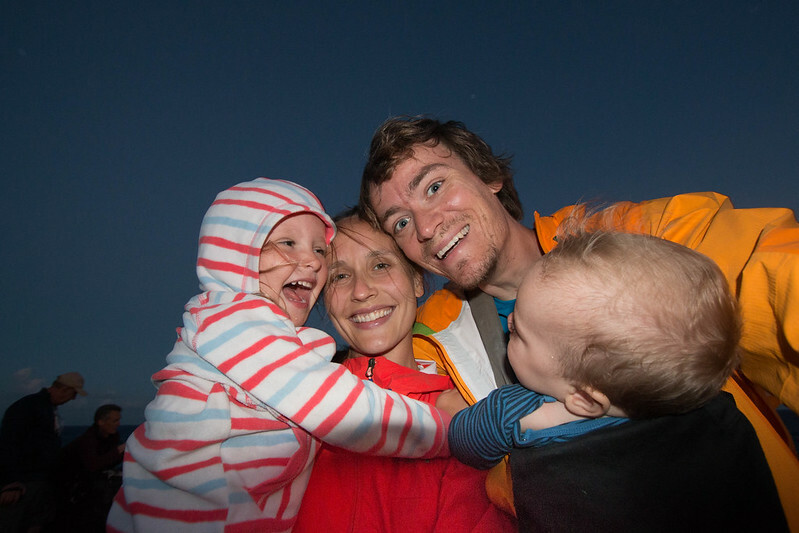 Annika’s next best seller should be about how to organize, prepare, enjoy and survive such an adventure with a young family. Cuba must have been a real challenge but you all survived in good health and spirit. Congratulations!!!! You are celebrities! 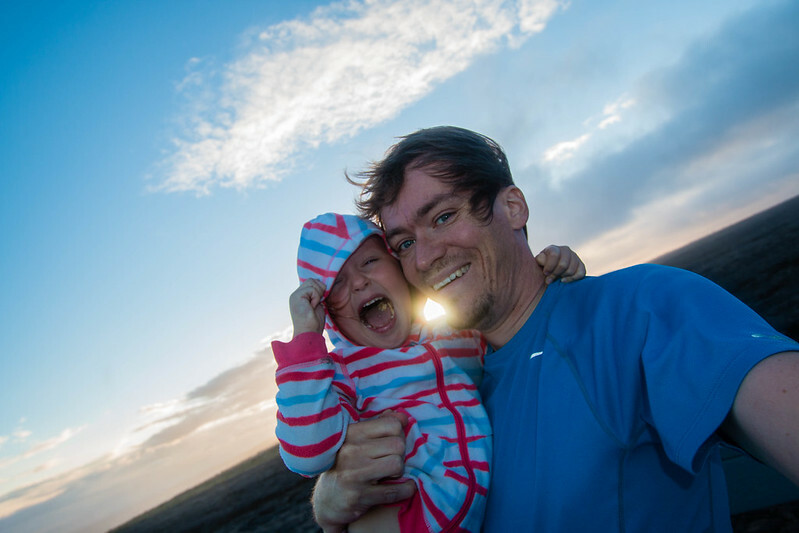 And…….. Daniel, never lose that infectious smile and positive attitude.